Andy is one of the writers of this multi-award-winning HBO sitcom. It’s won three Emmys so far. Veep is about the struggles of Selina Meyer (played by Julia Louis-Dreyfus), stuck in the job of America’s vice president when she would MUCH rather be the president. The team she relies on is plagued by internal feuds. Will she ever get to sit in the big chair? There’s no end to the intrigue. Or the swearing. The show was created by Armando Iannucci, who was behind the BBC’s The Thick Of It and the movie In the loop. Andy and Kevin have worked with him lots of time before, notably in The Armando Iannucci Shows, The Friday Night Armistice and The 99p Challenge. 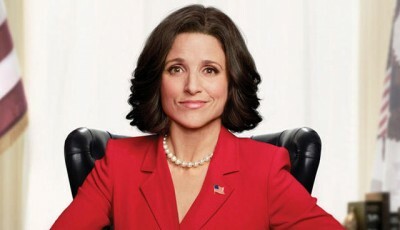 You can watch Veep in the UK on Sky Atlantic. The official HBO website for the show is here.